In producing this booklet of 25 double-spread pages, Peter offers us a rich source of material, most of which appears in print for the first time and is the result of a great deal of original research into a wide range of documentary sources. A general survey of Morden parish from AD 1 to the year 2000 leads the reader into a detailed account of 20 locations into which Peter has divided Lower Morden. The whole is illustrated with 47 maps and 39 photographs old and new, all reproduced to a remarkably high standard for a desk-top publication. The introductory section of the booklet explores the development of Morden from a small settlement on Roman Stane Street to the population explosion of the 1920s and ’30s. With the departure of the Roman legions in AD 410 Morden disappears from view for more than five centuries, emerging from the ‘Dark Ages’ in the 11th century as an estate owned and managed by Westminster Abbey. The manor remained with Westminster until the Dissolution, when it came into the hands of the Garth family. The Garths were the ‘squires’ of Morden until the latter part of the 19th century, overseeing and directing the changes from open-field agriculture to a landscape of enclosed and individually tenanted farms. Two quite remarkable maps show Morden in the 14th and 16th centuries. This booklet will undoubtedly serve for many years to come as an important source for anyone with an interest in the area, from the experienced local historian to the general reader curious about the history of this locality. 1999, as part of a diocesan Open Day. All profits from its sale go towards church funds. were exploited under increasing population pressure, and the landscape was changed for ever. inspiration and the breadth of their historical knowledge. Apologies are offered for errors and assumptions which will hopefully be corrected in due course! The names of local settlements date from Saxon times. Morden probably means “hill in a swampy place”. may possibly have been of Roman date. retained the estate until the 16th century. Christianity to the Saxon kingdom of Kent. for the sum of £200, but also paying £2 a year to the King. part of that farm until the end of the 19th century. from “Twirey” to “Twiney” in 1803, and even “Swing” in 1818. There were also Twyry lands in the adjoining West Barnes estate. Hobalds Farm had been Merton Priory property since the early 13th century, and this piece of meadow had probably been claimed by the Priory out of the Common Mead. Although in separate parishes, these two adjoining pieces of meadow have remained together until the present day. Hawks Mead, adjoining Short Hills, and the 4-acre Rale Mede. Mead, belonging to a smallholding in the tenure of John Cowing. Surprisingly little land in this area was still meadowland by 1838.
the parallel section of Camborne Road. meadows were no longer as important as they had once been. commissioned by William the Conqueror to find out provide support for either the Abbot or the monastery. what and how much each landholder held in land Morden was allocated to the monastery kitchen. and livestock, and what it was worth. The Abbey of Westminster holds Morden itself. tenants paying rent as well as providing labour service. 1 mill at 40 shillings. Value before 1066 £6; now £10; however, it pays £15. Ravensbury manor, with lands in Mitcham and Morden. mentioned in 1225 were no longer part of the manor. There were five smaller freehold properties in Morden, succession of tenants or farmers. cottages, yards and small plots of land. The demesne lands were all listed by name and freehold property in Lower Morden. Westminster Abbey had been deprived of its estates. century this estate included the 2½-acre Gallows Mead. By 1745 the Common Mead seems to have been totally enclosed. Hobalds Mead, and a 6-acre close adjoining Longmead. feeding the livestock during the winter months. Each villager was allotted part of the Common Mead. small holdings such as Plomer Shawe, which only had 3 acres of arable, had one acre of meadow in the Common Mead. surrendered to the Crown in January 1540. Nottinghamshire and Staffordshire, for £699 18s 1d. in 1639, on the death of Richard Garth II. William Booth, who was nominated as Rector in 1634.
leased the farm later known as Lower Morden Farm. succeeded by Mary, an ardent Roman Catholic. Shene Priory, the lands returning to the Crown. of the open fields and to reorganise the farms there. II in 1661-2, following his return from exile. 1. Eleven of the householders were widows. As well as the mansion, another important landmark is the Mound. summerhouse. Perhaps both suggestions are true. local field names may provide some clues to its prior existence. such a name being associated with burial mounds. refer to a memorable death in the area. later Morden House. By 1838 the estate totalled 210 acres. customary land, held by the villagers. 24 acres to the north of Martin’s Farm, which was to become vacant in 1780.
around 1750, and Morden Park from 1768-9.
house, Growtes, sold by the Garths in 1682. His father owned nearby Mitcham Grove. Many maps of the area date from this period. (1793), Faden (1800), and Greenwood (1822-23). road, the old school becoming the Parish Hall. under the Poor Law Amendment Act of 1834.
a detailed survey of Morden in 1838.
formerly Cumberstrode Ruffett (see page 21). on the estate, and had probably been part of the original wood. been a surviving fragment of Longhill Wood. District Council in 1936 as a permanent open space. London County Council between 1926 and 1929.
on this land, more than 3,500 of them in Morden. St Helier brought changes to Morden’s boundary. Association for an extensive housing estate. Innes from the 1870s, Morden remained a village. southern end of what is now Garth Road. from a village to a suburb. Tudor Drive, and Wates built in the Garth Road area. Edinburgh Court and Thornton Court in Grand Drive. was recorded for its Morden estate. arable land, but less valuable land seems to have adjoined it. 18th century it had become a substantial wood. Council as a permanent open space. from Bryons Farm to Morden Park in 1783.
whereas only 3 acres passed to Thomas Conway in 1784. The parish boundary with Merton makes several turns in the Bowhill area, and it was necessary to mark these corners in someway, so that the boundary would be preserved. In earlier centuries marks were cut on trees, and children were bumped there when ‘beating the bounds’ so that they would remember these locations. young boys. This map shows “the position upon which it was resolved to erect new boundary posts”. More than 30 new posts were erected, one of which still stands behind Thurleston Avenue, just outside the allotment gates. The eight “New Cottages” were built in 1907. Lilian Grumbridge has published her memories of her childhood here. Manship’s daughter rand heir, Ann, married Simon Ewart, son of John Ewart who built Morden Park on land he leased from the Garths from 1768. According to Land Tax records, Manship sub-let the farm to successive owners of the nearby Cannon Hill estate. each held small closes and acre strips in Bowhyll. Graves Farm included 2 closes there totalling 8 acres in leases of 1588-1745. Bowhill Close joining east on Combestrode, containing 4 acres. the slopes of a hill, formerly known as Bowhill. were now in small closes, rather than the scattered strips. In 1521 John Hyller held two separate 1-acre strips in Bowhyll. the south and land of the vicar of Morden on the north. the adjoining farms from the 1880s. Morden Farm, some 200 years before. in the occupation of Thomas Warden”. in the reorganisation of Garth farms in Lower Morden. had probably been Manship’s 3-acre ‘Stack Meadow’ and orchards. to Richard Garth, and was farmed by Thomas Marshall. and consolidation of Garth properties in the area. Farm on the opposite side of Lower Morden Lane. and in the area east of Epsom Road and south of Green Lane. 2½ acres of meadow and 35 acres of pasture. as odd parcels of arable and meadow land. farmstead and a 1-acre close adjoining, called Winters. which had a 3½-acre close called Winters in 1617.
meadow in the Common Mead. It was farmed by William Parker. A John Parker had held land in Morden as early as 1494, but we do not know whether it was this farmstead. and later by two sons-in-law, David Benet and Thomas Hicks. It was one of the biggest properties in Lower Morden at this time. Pyl Brook, on the north by Lower Morden Lane, on the east by Hawkins Lane and on the south by the continuation of the back lane towards Merton Common. Four Acres Common, an arable field, and the 6¾-acre Mint Field Meadow belonged to Peacock Farm. The corner where the Nursery now stands was a separate property until the 1860s. It was a freehold property, not leased from the Garths. Watney sold it to the Garths in 1862.
half an acre, then owned by Elizabeth’s son-in-law, William Rawlins. before the end of the 16th century. shown on the Tithe Apportionment Map of 1838 as Great Mill Field (plot 43). Could there have been a watermill on the East Pyl Brook? It does not seem very likely. The name did not appear in early lists of field names. In the16th, 17th and 18th centuries this field was part of a “12-acre close lying behind the barn”. It had probably originally been three closes of pasture, each of 4acres, belonging to the three medieval tenements here. By the end of the 16th century the central tenement had taken over the closes belonging to its neighbours. The name did not appear in early lists of field names. In the 16th, 17th and 18th centuries this field was part of a “12-acre close lying behind the barn”. A field called the Two Slips of 4 acres. This land might have been demesne land of the manor. In 1617 Wynterworthes included 1 acre “in a close called Southwelles of Mr Garth’s”. Wikefield may possibly be the Wyggeshyll Close mentioned in1521, on the north of Hungerhill, the later Stonecot Hill. the two enclosures were formerly one, known as Fyrsy Close. suggests it was all of poor quality, and the poorest arable land was commonly abandoned after the Black Death, gradually reverting to scrub. In the light of this, it is possible that the ‘plott’ may actually depict a single close, north of the ‘fyrsy’ on Hungerhill. These three fields are now crossed by Kingsbridge and Lynmouth Avenues. The modern roads still follow the curves of the ridges and furrows of the medieval furlongs. acre Barn Close probably adjoined it. reorganised into four large farms, with larger units of adjoining fields rather than the small scattered fields that had developed over the centuries. The 12-acre close behind the barn was divided between two of these farms. John Manship was allocated one section, adjoining his farmstead. The rest continued as the Home Meadow of the farm later known as Lower Morden Farm, though it was divided into two fields. The farmer was called Richard Mills. Great Mill Field seems to have been the larger of the two fields belonging to Mills! The other was Little Mill Field. Morden had a watermill at the time of the Domesday Survey in 1086. It was probably on the Wandle. The most likely location would be in the area now known as the Watermeads. There are mills on the Mitcham bank. and the most likely explanation is that this was the mill site. two other mill sites in Morden by the 16th century. mill on the Merton side of Morden Hall in the 1620s. The Ravensbury Mills apparently date from the 1680s. As today, one end of Bow Lane was at Lower Morden, but its other end reached the village of Merton. roundabout is roughly on the same route. roundabout to Kingston Road, was also part of Bow Lane. The next stage of development took place in the third quarter of the 18th century, when most of the smaller farms were absorbed by their larger neighbours. This provided the opportunity to redistribute the various fields so that each farm had large blocks of adjacent fields rather than widely scattered small fields. John Manship’s former farm was divided between the others. The Tithe Apportionment map shows the three large farms, now known as Lower Morden Farm, Peacock Farm and Hobalds Farm. Most of the South Field belonged to Peacock Farm, with only a block of four fields at the eastern corner belonging to Lower Morden Farm, which had more land on Bowhill. The South Field was divided from the farmsteads of Lower Morden by a ‘back lane’, and various footpaths divided the furlongs. but most of the holdings were in acre and half-acre strips. By 1745 enclosure was complete, and each farm had a number of small closes instead of the individual strips of earlier times. Bowhill, from which the name probably originates, is found in documents by 1521. Molleson, and Mr Sherwood, had gradually encroached upon Bow Lane, and closed it, including it as part of their estate. Senior residents of Merton and Morden were called to give evidence that the road had always been open for carts travelling between Merton Common and Morden. The 1838 Morden Tithe Map shows a number of tracks in the area, some of which still partially survive. A ‘back lane’ ran between the South Field and the farmsteads south of Morden Green, and continued as far as Morden Common. The present footpath and footbridge between Garth Close and Lynmouth Avenue marks where this lane crossed the Pyl Brook. Twyry Lane, which ran along the Merton boundary to Bow Lane. northern edge of what was formerly the South Field of Morden. furlongs, and each villager had a number of one-acre strips scattered among the different furlongs. including Longfurlong, Shortfurlong, Spotfurlong, Strutfurlong, and Hungerhill Shott. but the survey of 1312 shows that most of these ‘demesne’ lands were in compact blocks in the northern part of the manor. of World War II as a Merton & Morden Civil Defence Depot. Civil Defence structure to survive in the area. young to serve in the armed forces. coping with the casualties of the raids. The library opened here in 1946.
properties, one of which he sold in 1788, the other in 1790. 1865 Ordnance Survey map, but did not survive to modern times. to the Woods’ cottage, although he had no rights to the land. enclosures were often authorised in this way. soon after, as they were not on the 1865 Ordnance Survey map. wagon house and yard adjoining and belonging to it have now become part of Wyevale. There was also a small piece of grassland called Gilbert’s Meadow to the north-east. This had probably formerly been the farmstead of an 18¾-acrefarm known as Graves Farm, occupied by Binskin Baker in 1745.
they probably continued to live here. A previous tenant had been Thomas Warden, who was granted a lease on the property in 1679. Most of the factories occupy the site of the former brickworks. 1780. The Wood family still owned this copyhold property in 1838, when it consisted of two cottages. containing 1 acre In 1588 these lands were part of a 12-acre farm leased to William Grene, and it seems likely that the Elizabethan farm was based on this same farmstead. Centre alone keeps the tradition alive. held property in the Morden Hall area. In 1719 he assigned his lease to William Wickham, and either William or his son of the same name was holding it in 1745. It covered 75½ acres. William Wickham the younger died in 1771, but he had given up the farm a few years earlier. 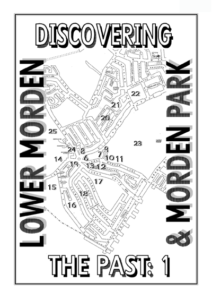 the earliest known large scale maps of Morden and its surroundings. furze and wood for fuel and fencing. claiming that Morden tenants had no rights in the common. The case went to the King’s court, where a plan or “plott” of the land in question was tendered in evidence. The accuracy of this was questioned, so Commissioners were appointed to investigate the matter at first hand and to produce a more accurate version. Both the “plotts” are now preserved in the Public Record Office. fuel, and so on. This was a privilege reserved for the lord of the manor and his copyhold and freehold tenants. ownership. None of these cottages had any lands belonging, and their owners were no longer entitled to claim common rights. all their copyholds, prior to selling the manor. and was the subject of many disputes over the centuries. In the 13th century the tenants of Malden manor had to remind tenants of Malden had rights of pasture there. neighbour, Graves Farm, seem to have been built on the green itself, and are therefore unlikely to have been part of the first phase of development. considerably smaller than the other farmsteads here, though in course of time they became the centres of substantial farms. Farm, on the opposite side of Lower Morden Lane, as well as other lands which brought the farm to almost 125 acres. the newly formed Morden Park estate. by which time another 56 acres had been added from John Manship’s former farm (see p.6). By 1838, when the tenant was William York, the farm extended over 156 acres. Opposite Peacock Farm was a glebe meadow owned by the Rector. held by William Batts, it totalled almost 69 acres, and in 1745 it was 70½ acres. The present green in Cardinal Avenue is on the site of these cottages. The creation of a cemetery here echoed the situation of a millennium before. and then along the boundary with Wimbledon. which was probably in the Hobalds area, between Lower Morden and Motspur Park. virgate of land, normally 20 acres. In July 1237 the remaining 12 acres were given to Merton Priory by Nicholas de Pyrle and his wife Johanna, probably William’s daughter, or perhaps his widow. Malden as well as Lower Morden. possession of Robert Garth, lord of the manor of Morden. were added over the years. in the town and fields of Mordon”. farmstead, occupied by Abraham Clarke in 1838 (plots 65-66). The site is between Cranmer Close and Lower Morden Lane. Southfield, one in Coombestrowde, and one in the Common Mead. the property of the Crown, who sold it in 1562 to private owners. known in 1838 as the Sheepshearers and later as the Jolly Farmers. Perhaps sheep were shorn within the confines of the green. There was another farmstead to the west of Clarke’s smallholding. farmsteads of John Howard in 1745, and later Richard Dallett. They had held the adjoining property, once part of Wynterworthes. Richard Garth II had bought Wynterworthes in 1629 from Bartholomew Fromond, who also had lands in Cheam and Mitcham. acres in four separate parcels in the common meadow, as well as almost 4 acres of coppice. Bartholomew’s father William Fromond had bought the property in 1602 from William Playstowe, who had inherited it from his father in 1596.
brother John probably had a similar amount. as The Kennels in 1937 when the farmhouse burned down, though actually a pig farm. Photographs from this period show a weatherboarded building with a jettied upper storey. The construction of the house may suggest a surviving wing of a hall-house. We can trace the occupants of this property back to 1745, when Mary Martin was leasing it from Richard Garth IV. A neighbouring property was leased to John Howard. These two properties had formerly been the single farmstead known as Wynterworthes. The house, with its orchards, gardens and yards, had covered 2acres, and a 3½-acre close called Winters adjoined it. Morden, when they bought it from William Lovelace in that year. Wynterworthes was probably named after an early owner. A William Wynteworthe appears in Westminster Abbey accounts for Morden in 1391 (see page 2). This entry was posted in Publications, Discovering the Past, Publications and tagged in discoveringpast, morden.